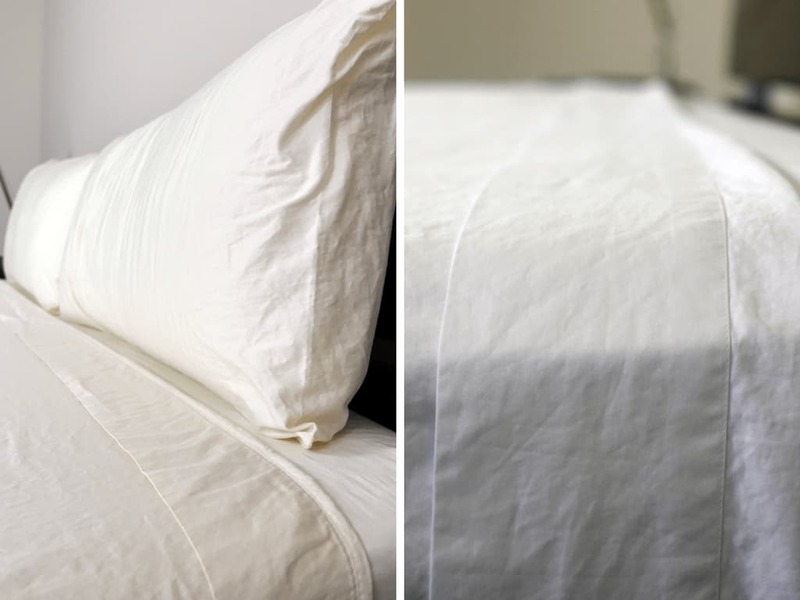 Home » Bed Sheets Ultimate Guide — What Are the Best Types, Materials, and Weaves? A person spends around one third of their life in bed, and making that third as comfortable as possible has a lot to do with their choice of bed sheet. Having a great mattress, or your ideal duvet and pillows can be negatively affected if the sheets you’re covering them with are wrong. But the variety of different options, from material to weave to thread count, can make the bed sheet buying process seem insurmountably complicated. Here Sleepopolis breaks down all the different decisions to be made when it comes to choosing your perfect bed sheets, in order to help you get the very best from your bed. The first decision to be made is what material you want the sheets to be constructed from. 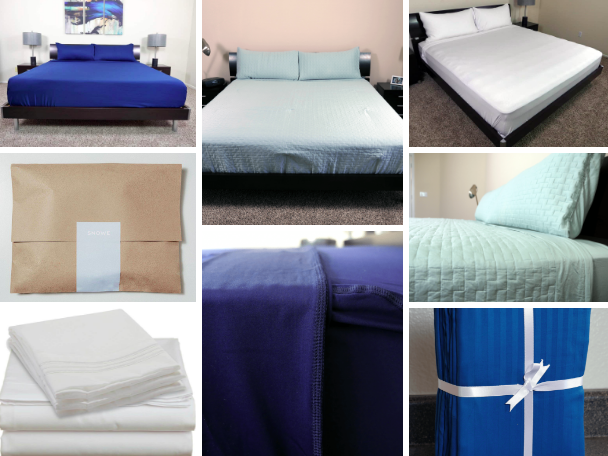 Here are a breakdown of the most common bed sheet materials, along with their pros and cons, to help you figure out what best fits your needs. Cotton is a very popular choice when it comes to bedsheets, and has been used for at least 7000 years. It’s made from a fluffy fiber grown on the cotton plant. Pros: Cotton is durable and strong, holds up well to frequent washing, takes dye well, maintains a comfortable body temperature, and is hypoallergenic. Cons: The main problem with cotton is its large disparity in quality. Many “100% Cotton” bed sheets can feel cheap, scratchy and uncomfortable, because of a very low thread count or poor construction. When buying cotton it’s important to do your research. Egyptian or Pima cotton are both a more luxurious type of cotton. This is due to the higher thread count, making for more luxurious feeling sheets. Both of these types of cotton have a longer “staple” fiber, meaning the weave is smoother, and the fabric is stronger. Pros: These more luxurious cottons are stronger and feel softer. They also have a more lustrous appearance, and have better moisture absorption. Cons: The main negative when it comes to these luxe bed sheet materials is price. They can be very expensive, so if you’re on a budget you may be able to achieve a similar effect from another material at a lower cost. Plus, like with all cotton bedsheets, assessing the quality can be confusing. A general rule of thumb is, if a deal seems too good to be true, it probably is. Flannel bed sheets are actually also made of cotton fibers, but these are finely brushed to pull loose tiny top fibers. These bed sheets are also referred to as brushed cotton. Pros: Flannel bed sheets are very warm and cozy feeling. They have a slight fuzziness or fleeciness to the touch, which some people find very comfortable. Cons: For those in warm climates, flannel bed sheets are likely to feel stifling. Because of their thicker texture and heavier weight, they can take a long time to clean and particularly to dry. Tencel is made from cellulose fibers of eucalyptus trees. First developed in 1972, it is gaining popularity as a cotton alternative. Pros: Tencel is generally considered more environmentally friendly, as it’s made from sustainable and fast growing trees, and created using what’s called a “closed loop process” – meaning no chemicals leak into the surrounding ecosystem. It’s also soft and very cool, wicks moisture away from the skin, and is very durable and long-lasting. Cons: Tencel has a smoother and slicker feel than the crispness of cotton, which some people dislike. It can also be more susceptible to mildew, thanks to the hydrophilic (water loving) qualities of its fibers. They can be more expensive than 100% cotton (although tend to be less expensive than Egyptian or Pima cottons). Bamboo bed sheets are, you guessed it, made of fibers from the bamboo plant. 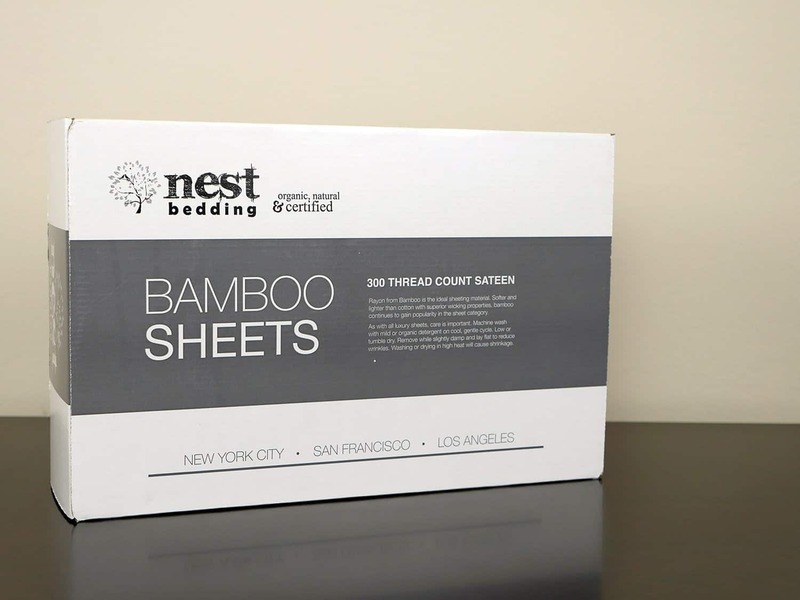 Pros: Bamboo sheets are extremely lightweight, and can offer superior cooling. They’re durable, soft, and absorb dye well. Bamboo is a very fast growing plant, making bamboo sheet production more sustainable. Cons: Bamboo bed sheets require more gentle care than cotton or Tencel. They also wrinkle more easily, and can be on the pricier side. Polyester fibres were developed in the mid-20th century. It’s a synthetic polymer fiber and is totally man made. Pros: Polyester is extremely durable, wrinkle resistant, washable, and has a low price point. Cons: Polyester is not a particularly breathable fabric, meaning it can trap moisture and heat. It is also prone to staining by oils or grease. And although polyester doesn’t become thin over time, excessive washing can lead it to pill. Microfleece is technically a type of polyester; however it is designed to have a slight pile to the fabric to replicate the feeling of flannel. Pros: Microfleece repels water and dries very quickly. It’s durable and easy to care for. Microfleece bed sheets are also typically very affordable. Cons: Microfleece bed sheets may trap heat, which makes them uncomfortable for those who live in warmer climates. Over time, they can pill, particularly if washed and tumble dried too rigorously, which can look unattractive and irritate sensitive skins. Modal is similar to Tencel and bamboo in that it’s constructed from plant fibers, but this time they’re from the beech tree. Pros: Modal is soft, and stands up well against shrinking, fading or becoming misshapen. They’re breathable and cool, and resistant to pilling. Cons: Modal bed sheets can be harder to care for, as they must be washed on a cooler setting and dried on low. If they aren’t treated gently, modal bed sheets can be prone to tearing. Linen is made from the flax plant. It’s an ancient fabric, and was even used to wrap Egyptian mummies. Pros: Linen has a very distinctive, rustic appearance, which many people find appealing. It is soft, and softens even more with each wash. Linen sheets offer cooling properties, are antimicrobial, and have a natural color so don’t need dyeing. Cons: The fibers of the flax plant are very non-elastic. This means linen is excessively prone to wrinkling, and have low resilience to folding or crumpling. Silk is a natural protein fiber, and a very luxurious material. It’s woven from fibers created by silk worms. Pros: Silk sheets are great for both warming the body in winter and keeping you cool in summer. It’s less moisture absorbing than other bedsheet options, meaning it can be great for those with dry skins or eczema. Silk sheets feel very smooth and luxurious. Cons: The main drawback of silk sheets is the price – they can be extremely expensive. Silk bed sheets are also difficult to care for, and may require being hand washed. The slippery feel can also be a drawback, depending on personal preference. Something else to consider when buying your perfect bedsheets is weight. Even within one fiber type, there can be a huge variation in thickness, warmth and heaviness. It really comes down to personal preference here. If you tend to run hot, live in a warm climate, or have a thicker duvet and foam mattress, you may want to opt for a lighter sheet. Conversely, if you tend to run cold, live in a less temperate climate, or have a lighter weight duvet or innerspring mattress, a heavier weight may be for you. This rule generally only applies to cotton. A higher thread count means a finer and more subtle thread. A lower thread count means thicker, less refined threads. However, extremely high thread counts can mean sheets which are less durable, and more prone to tearing or wearing thin. The thread count also effects the superficial feel of the sheets – a higher thread count means sheets will feel silkier and softer, while a lower thread count lends itself towards a crisper feel. It’s important to be aware that even in terms of cotton, the thread count is not the be all and end all. A longer staple fiber and a lower thread count can feel more luxurious and be more durable than a shorter staple fiber with a higher thread count. There are ways for a manufacturer to up the thread count (and thus up the perceived value) of a bedsheet, without actually upping the quality. 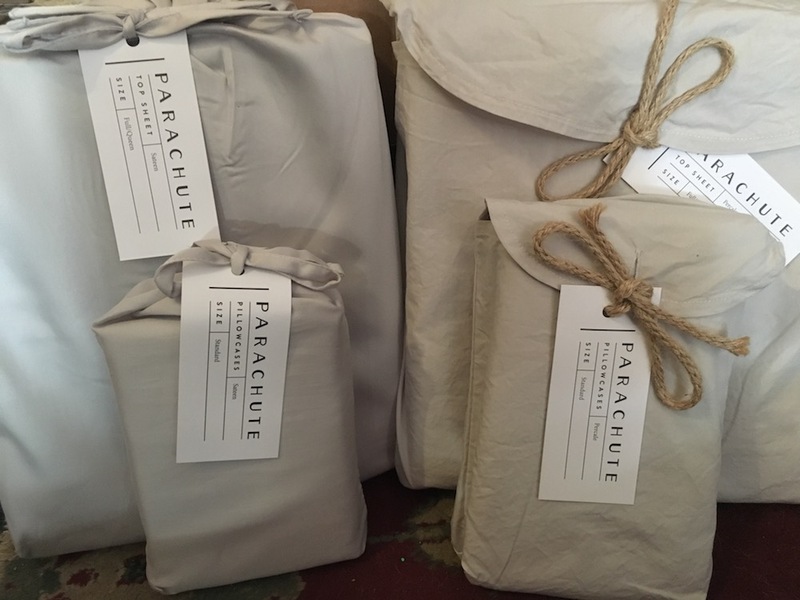 Parachute’s sateen and percale packaging side by side. A percale weave refers to the most common bed sheet weave. It’s a crisscross pattern, with each side having the same amount of surface thread. Percale is durable, lightweight and breathable but can feel slightly rough. This weave usually result in a more matte finish. 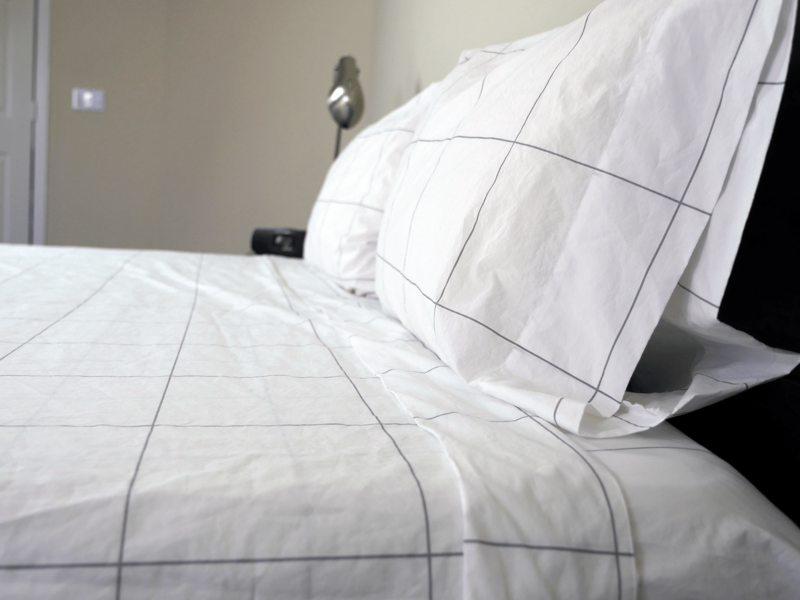 Bed sheets woven in the twill style have the appearance of diagonal lines across the surface, like that seen in denim. Twill bed sheets are generally strong and durable and drape well. 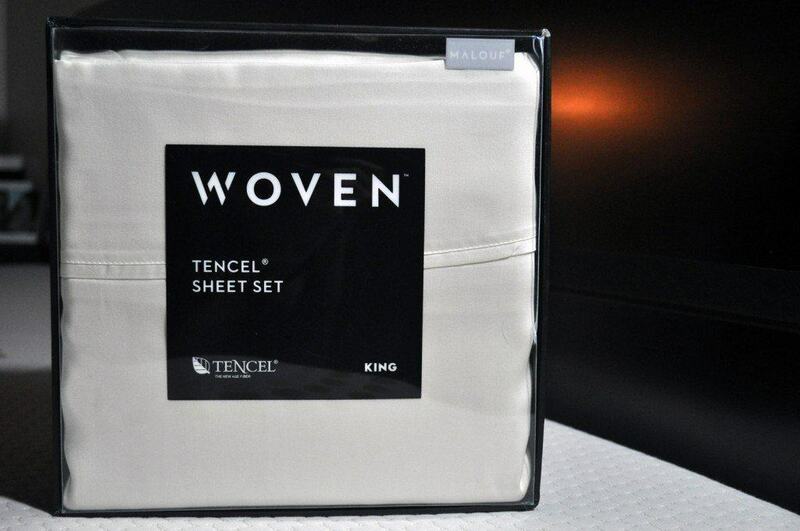 A bed sheet woven in a sateen style will have more fibers along the surface. While this means they have a smoother and more luxurious feel and attractive shine, it also leaves them more prone to snagging. A jersey weave is not actually woven at all, but finely knitted. A bedsheet with a jersey wave has a more casual appearance, a softer feel and lots of stretch and elasticity. Something constructed with a pattern weave has a design woven into the texture of the sheet. Two of the most common types are brocade and damask. They have a luxurious, vintage look, and tend to be much heavier. Bed sheets with a patterned weave can be much more on the expensive side. A dobby weave refers to a design or pattern woven into the fabric. Dobby woven bed sheets commonly incorporate simple elements such as dots or stripes. On top of decisions of fabric, weight and weave, some bed sheets have a specialized finish. This can affect the look, feel and characteristics of a bedsheet. Options of bedsheet finishes are as follows. Printing. This refers to a design or pattern printed directly onto the bed sheet. Seersucker. This refers to a slackening of tension, resulting in a slightly puckered or crimped surface, sometimes in stripes. Waffle. Sometimes called honeycomb fabric, this is a fabric with a textured pattern which is very absorbent because of its increased surface area. Fitted Sheets. These sheets have four elasticated corners which grip the mattress. They are more secure and easier to make up. However, fitted sheets are more difficult to fold and store, and are therefore much more prone to wrinkling. Flat Sheets. A flat sheet is simply a large piece of fabric. Although these are more difficult to make up on the bed, they fold and store well. Another advantage is that a flat sheet can fit its designated bed size and any smaller than that, while a fitted sheet will fit only one specific mattress. One important factor to consider when purchasing bed sheets is how they fit your very specific and personal needs. Buying the most expensive, luxurious or beautiful sheets is moot if they don’t work for your lifestyle. Here are some things to consider. Climate. If you live somewhere warmer or are consistently warm during the night, this is an important factor to consider in terms of bedsheet fiber, weight, weave and finish. Similarly, if you’re consistently chilly by night, or you live somewhere less temperate, going for something warmer can vastly improve your quality of sleep. Washing. You may love the appearance and feel of a silk sheet, for example, but if you don’t have the time, patience or space to air dry, they simply won’t work for you. Be realistic as to how much care and time you’re willing or able to invest in order to maximize your bed sheet experience. Personal Preference. While the general consensus may be that one material is superior, if you personally prefer another, that should always override popular opinion. Consider whether you like something crisp or something soft, something which look vibrant or something more subdued, or how averse you are to wrinkles in order to get the sheets which best suit you. For more information, or specific bedsheet reviews, please refer to the Sleepopolis Guide. Here we have reviews of dozens of different sheets, so you’re sure to find a set to perfectly suit you. thanks a lot for this cool article, lot of useful informations! I am a Textile Professor at Parsons. Can you tell me what countries weave LINEN bedsheets. I was also wondering if quality of linen fibers determined where? This linen fiber quality would be determining prices?